There are two areas on the dashboard where social media links can be added. One is on your owner profile - My Profile The links under your owner profile will then be associated with whatever properties you are listed as owner of, and will appear below your name on your property homepages. The other social sharing platform, the one located on your dashboard under the Manage Configuration > Configure Social Sharing Platforms tabs, is where social media accounts linked to your site as a whole can be inputted, not just accounts linked to a specific property owner. 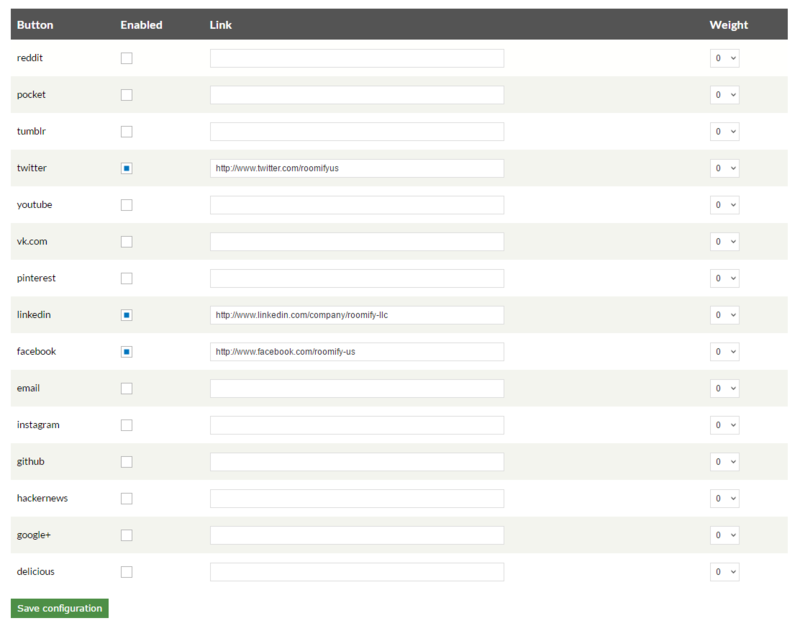 Configure > Social Sharing Buttons To set up in which pages social media links will appear. If you are a single-property site, it is up to you whether you input your social media accounts into both fields. Alternatively, you could link your personal accounts to your profile, and then your property accounts under the Configure Social Sharing Platforms link. If you are a multi-property site, then the individual owners will link their property accounts to their profile and your overarching site accounts will be linked under the Configure Social Sharing Platforms tab.